After reading Bee Tee Dee’s Salute To Nightmare Fuel yesterday, I felt inspired to share some of my own. Growing up, I was a huge fan of the Halloween series. I remember watching John Carpenter’s Halloween on Fox 5 and loving it (even though all the bloody bits were cut out) so much that I made a concentrated effort to buy every movie in the series on VHS; that included Halloween III: Season of the Witch. These were the days before the Internet and I never bothered to read the back of the VHS box. 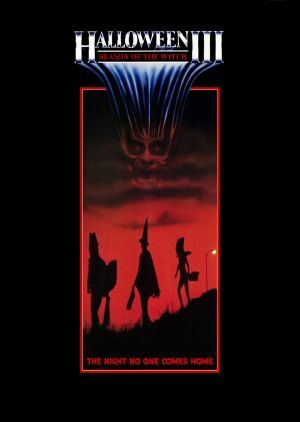 All I knew was that it was a Halloween movie and the box art was awesome! I did not know that Michael Myers wasn’t in this movie. I did not know that John Carpenter and producer Dino DeLaurentis planned to make the Halloween franchise an anthology series ala The Twilight Zone. I did not know about the jingle the film’s main villain, Mad Scientist/Celtic Warlock Conal Cochran, would use to turn children’s heads into bugs and snakes. I was just a tad disappointed. Looking back, Halloween III: Season of the Witch does hold up as a bad 80s horror flick – and damn if the Magic Pumpkin jingle below isn’t pure Nightmare Fuel!